Very.co.uk urges people to “Get More Out of Giving” in its Christmas advert, that pulls at their hearstrings. 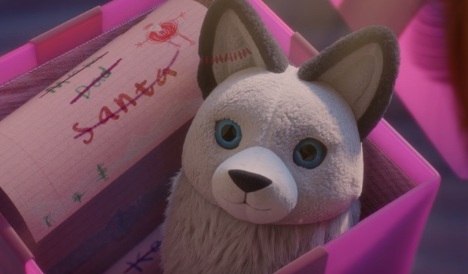 The spot features a little girl with a stuffed toy wolf giving pink-wrapped gifts to her dear ones, who are all written on a list. Until Christmas Eve, she manages to cross almost all the names off her long list, except one. The night of Christmas Eve, she leaves her cosy bed and embarks on a journey through the snow to deliver the last gift. Along the way, she loses her rag-eared toy and finds herself alone, but not for long. A wolf shows up and helps her on her quest, until one point. When the ice they’re walking breaks, her final pink gift falls and the wolf runs to get it but doesn’t come back, falling into an icy waterfall and leaving her in tears. As the spot comes to an end, with the gift and the toy wolf being pushed by water in front of some black boots, it is indirectly revealed that the last name on the girl’s list was Santa’s, who gets her gift, eventually, and makes her a surprise on Christmas day. When she wakes up, the next morning, in her bed, she finds the pink gift box left on her window ledge and, opening it, she find her wolf toy with his rag ear sewn up and her list with the final name magically crossed off. “Get More Out of Giving at Very.co.uk.” – the voiceover says at the end of the spot, which is soundtracked by an original song titled “Anna & the Wolf”, composed specially for Very by Guy Farley and recorded at Abbey Road Studios. Very.co.uk offers a wide range of fashion, home, gifts, electrical products and more, with high street brands and most products available via the company’s free next day delivery service, from Collect +.